We are an acoustic vocal trio comprised of Reid Wilson, Margaret Wilson and Marilynn Massie. All three of us are long-time residents of Uxbridge, Ontario. Reid plays rhythm guitar and arranges our favourite songs to highlight and blend our individual voices, mostly in three-part harmony. 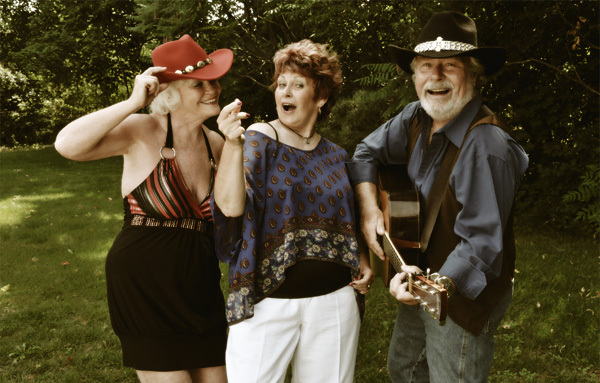 Marilynn, Margaret and Reid first met through Sweet Adelines in Uxbridge, Ontario, in 1998. The term “afterglow” is commonly used by Sweet Adelines for the party after a performance, where the chorus members get together and sing their songs again for the pure love of the music and the fun in the camaraderie. “Afterglow” describes how we feel about each other and the music we sing. We enjoy asking people to come … “Bask in the ‘AfterGlow’ of some really great tunes”. Marilynn and Reid, began AfterGlow as a duo in 2003. Marilynn was the lead singer in Moonlight Express, a Sweet Adelines barbershop quartet; and Reid was singing, playing and recording in a folk group called FullCircle. After singing together for a year, Marilynn and Reid recorded a Demo CD together at Studio 92 in Toronto and continued to sing at local venues in Uxbridge for several years. Margaret sang with Uxbridge’s Pineridge Chorus of Sweet Adelines, and then with the York Highlands Chorus in Newmarket until 2008. It was then that she joined Marilynn and Reid, and we officially became a trio. Reid’s rhythm guitar has always been the only instrument used as accompaniment for our live performances. We more recently discovered that our friend John Frechette, was a former drummer and percussionist extraordinaire. John joined us in mid-2012 adding much colour, rhythm, energy and just plain fun to our rehearsals and live performances, and is now an integral part of our live sound. We all have different backgrounds in music preferences, so we try to choose songs that have some appeal to all of us. AfterGlow covers different genres, different writers, some old favourites, and some that will be new to our listeners. Our music is probably classified as “crossover” as we perform songs that are folk, country, pop, and rock. We especially like to promote Canadian singer/songwriters by covering their songs whenever we can. 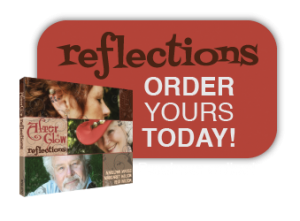 We are just completing our first CD project called “Reflections”. Watch for it in April 2013.